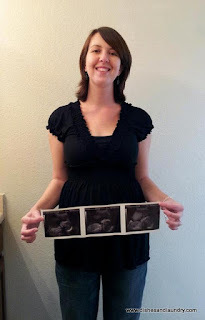 The baby's first photos! We had our first and likely only ultrasound on Tuesday. 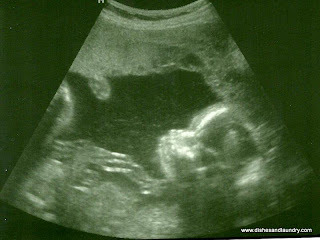 It was the 20 week anatomy scan though we waited until I was 22 weeks 4 days so it would be in the 2012 plan year for our insurance deductible. It was so amazing to see the baby. My favorite part was the tech got an up close shot of the baby's little lips and nose, and they looked just adorable. The tech said everything looked great and got all the measurements we needed. We left there with about 15 profile photos of the baby and a live action DVD of the whole thing. 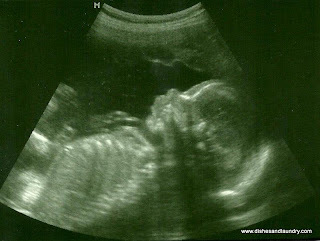 Technology has definitely improved over the past 12 years since I've been pregnant! We also got a call from our midwife yesterday going over the ultrasound report and she said everything looked perfect. We have a healthy baby growing in there! I wasn't worried something was wrong but hearing those words, "your baby looks perfect" sure felt great. At my 22 week appointment I was measuring 24 weeks or 2 weeks ahead according to fundal height. At the ultrasound the baby was 1 pound 4 oz and measuring 5 days ahead. Since we're past the first trimester and babies grow at all different rates according to their genetics they will not adjust my due date but I'll likely have a bigger than average baby. Brennan was 8 lbs 1oz and I was 8lbs 12oz and hubby is 6'0" tall and 180 pounds so I wasn't expecting a small baby to start with. We were just happy to hear everything looks great and get a sneak peek at the baby. The day was even more special because hubby and the kids all got to be there to see the baby too. I can't believe the baby will be here in a little under 4 months! Glad to hear things are going well! Can't wait to meet my future niece or nephew! Yay for a healthy baby ! You look so happy! I love it! Congrats again!